An open bag of Popchips in their yummy new Katy’s Kettle Corn Chips flavour. As Beyonce has Sasha Fierce, I imagine Katy Perry’s performance alter-ego is entirely different than her real self. Which is why I have absolutely no trouble reconciling these Popchips endorsed by Perry based on what I know of the singer. After a show, once she’s wiped away the makeup and hung up the cupcake brassiere for the night, I reckon she’s the sort of normal person who munches on a bag of Popchips while watching PVR’d episodes of Grey’s Anatomy in sensible, comfortable pyjamas. For every Notorious B.I.G., there’s a Christopher Wallace making a turkey sandwich in the kitchen at 11 on a Thursday night. Kettle corn is a guilty pleasure, a tantalizing mix of sweetness, saltiness and oily delight, yet the Popchips version promises to be a healthier alternative to the real thing. On the surface, it’s sweet and crunchy, but below the surface, it’s allegedly somewhat wholesome. The Look: The packaging is a pretty black/purple/magenta/mauve mix, with golden yellow highlights. Through the magic of Photoshop, some sparkle has been added to the product shot on the front, making them look all magical and yes, sort of Katy-Perry-like. Also note the heart dotting the “i” in the Popchips logo. 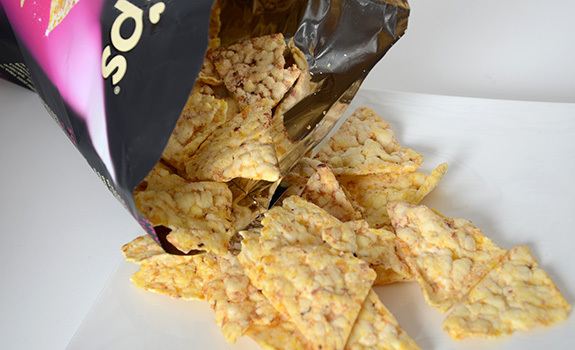 The chips are triangular, like typical tortilla chips, and have a bubbly surface. The Taste: Unexpectedly delicious, and not lacking in flavour at all. These hit all the right notes: sweet, with a nice level of salt, a light hint of oil (a bit like movie theatre popcorn) and a corn flavour that’s more Corn Pops than anything on a cob. I could easily demolish a bag with little effort. 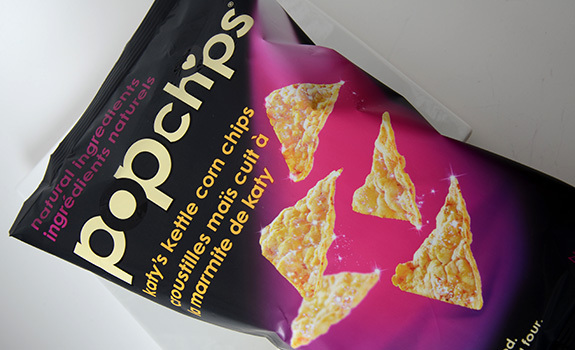 The colours on the packaging of Popchips’ Katy’s Kettle Corn Chips flavour are very Perry-like. Cost: $2.69 for a 99 gram bag at London Drugs. Availability: There was a display full of these at my London Drugs. Probably easy to find these in Canada and the U.S. Nutrition? : Per 23 chips (40 grams): 180 calories, 6 grams of fat, 180 mg of sodium, 2 grams of fibre, 3 grams of protein. The verdict: I like. I’d buy them again in a hummingbird heartbeat.